The Belgian architect Victor Horta transformed Brussels in the 1890s and early 20th century with his sublime Art Nouveau style. The city is marking the 70th anniversary of his death with the festival Horta Inside Out. Involving 20 cultural organisations, the programme offers a year of events in buildings designed by Horta, including Bozar and the former Waucquez department store. Here are eight ways you can discover Horta’s genius in 2018. Many of Horta’s finest buildings are still owned privately, so they can only be seen from the outside. But the international organisation Réseau Art Nouveau Network has developed a smart way to reveal hidden interiors on digital devices. Just log on to their website to access archive photographs. The site also suggests trails leading to other Art Nouveau houses in the neighbourhood. Several organisations offer guided tours that take you into neighbourhoods where Art Nouveau architecture developed in the years around 1900. You are led by knowledgeable guides through fascinating areas including Saint-Gilles, the Ixelles ponds, the Marolles, Schaerbeek and suburban Uccle. Most tours are organised by the urban organisation Arau, whose programme includes walking tours and visits by bus. 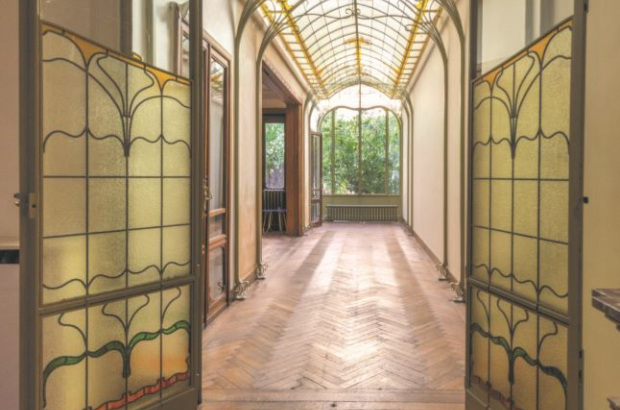 The cultural organisation Explore.Brussels organises privileged tours that take you inside some of the city’s most private Art Nouveau houses. Their programme includes a visit to Victor Horta’s Hôtel van Eetvelde in the EU quarter, the Hôtel Frison near the Sablon and a tour of the Hôtel Max Hallet on Avenue Louise. Most tours are in French, but a few are given in English or Dutch. Horta is admired by architects for designing innovative spaces that brought light into traditionally dark Brussels interiors. His techniques are revealed in an exhibition that runs for three months at the Horta Museum in Saint-Gilles. It covers his entire career, from the neat little classical temple he built in the Cinquantenaire Park to his monumental designs for Central station and Bozar. After lying forgotten for more than 40 years, a fabulous jewellery shop interior designed by Horta has been reconstructed inside the Cinquantenaire Museum. Dating from 1909, the Wolfers Frères interior lay for many years in a museum storeroom. Now it has been carefully restored to its original state. The polished mahogany cabinets were made by the London firm Frederick Sage & Company, whose customers included Harrods and Selfridges. Comic book author Luc Schuiten has renovated an old Horta house in Schaerbeek to create an exceptional experience. The rooms at Maison Autrique have been carefully restored, from the basement kitchen to the attic room. Schuiten and his partner, Benoît Peeters, have also reconstructed the lives of past residents with personal touches such as a suitcase, a winter coat and old books. The museum is hosting an exhibition on Horta in America in the summer. Its aim is to focus on Horta’s period as a refugee in the United States from 1916 to 1918. The Fondation Civa in Ixelles puts together an exhibition every summer that focuses on unbuilt Brussels. This year it is displaying plans and documents that reveal Horta’s ambitious project to transform the neighbourhood around Central station and Bozar. You can also see his unbuilt designs for a Congo Pavilion at the Paris World Fair in 1900. The Belgian art archive KIK-IRPA is marking the Horta year by releasing 1,500 photographs of Horta buildings, including demolished houses and department stores. The images include 48 nostalgic images of the Maison du Peuple, which was torn down in 1966, along with views of the Hôtel Aubecq on Avenue Louise and the demolished conservatory of the Maison Cousin in Saint-Gilles.